I've recently become slightly obsessed with a game I'm calling Music Note Races (and my students love it just as much as I do). There's nothing revolutionary about the concept but it has been so successful with all of my students from 1st grade through 6th grade that I had to share! 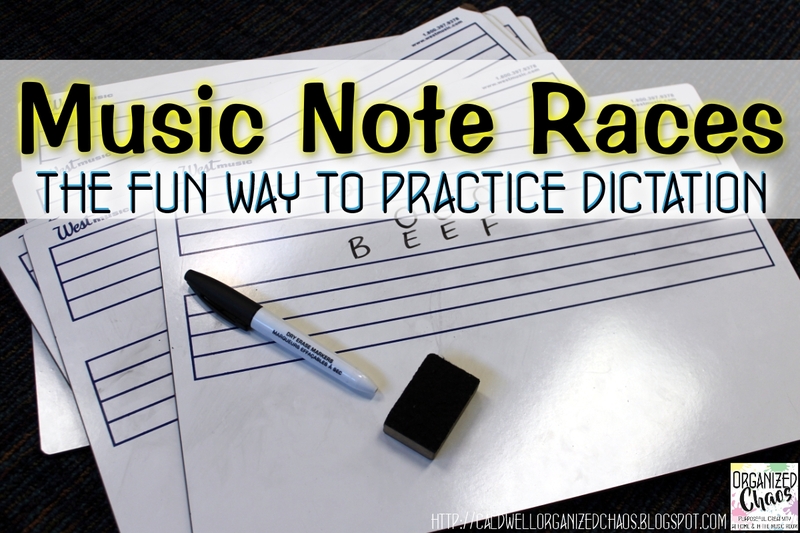 If you're looking for a new way to practice music dictation, whether you're focusing on rhythms, letter names, solfege, or any other concept, this may be just what you're looking for! Practicing dictation is an important part of my music curriculum. In the youngest grades I am especially focused on getting them to notate the solfege notes sol and mi on a 3- or 5-line staff and rhythms with quarter notes and rests and barred eighth notes. By the time they are in 6th grade, we are practicing notating in bass clef. The problem is that all of these skills require repetition to develop fluency, but traditional drilling is just too monotonous for all of us! The basic idea of the Music Note Race is to split the class up into small teams (3-4 students in a group seems to work best) and have teams race to correctly dictate the notes that you give them. 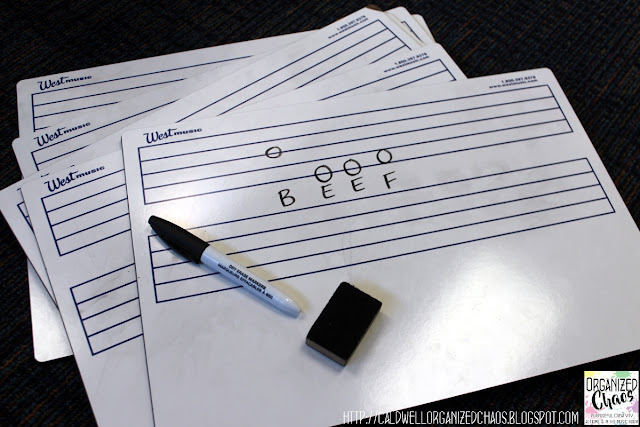 I have been using dry erase boards that already have the 5-line staff on them- if you don't have those, you can print out (or even handwrite) a large 5-line staff on a piece of paper and laminate it to make your own dry erase music staff. The rules: I have the students on each team either sit next to each other in rows of chairs or line up behind each other sitting on the floor, with the person at the front or far end of each team holding the board, marker, and eraser. I say the pattern they need to write, and the student at the board writes it down and holds up their answer. If it is correct I grab their board to show the class. If it is wrong (and nobody else has gotten the correct answer yet) I tell them to try again. The teammates are allowed to help verbally but they cannot touch the board, marker, or eraser. This keeps everyone engaged and practicing while giving everyone the opportunity to practice writing. After each round I give the winning team a point and they pass the board/marker/eraser to the next person on their team. I will usually try to wait until most teams have made their best attempt at finishing before announcing the winner- usually they are so engrossed in trying to write it down that they don't see that I'm holding the winning board until they look up after finishing their own answer. This way they don't give up as soon as someone else gets the correct answer before them! Some examples: I use this activity for a variety of musical concepts. For treble and bass clef letter names, I call out a word that can be spelled with the music note letters and have them "spell" the word with whole notes (pictured above). For solfege, I sing (and sign) a 2-4 note pattern and have them wrote it down (we establish where the notes will be on the staff beforehand). For rhythms, I clap and/or speak a 4-beat rhythm pattern and have them write it (in the blank space at the bottom of the board, or I also have mini chalkboards that I pull out for when I don't need a 5-line staff). Change it up: Even with the game aspect of this activity, it will still get old if you keep repeating it the same way every class. For those classes that have needed some additional practice (which for me has been 1st grade, learning to write solfege patterns for the first time, 3rd grade, learning treble clef letter names, and 5th grade, learning bass clef for the first time), I've found that changing it up a little each time keeps it fresh. Instead of dry erase boards, I've also used small chalk boards with chalk. I've also had each team race up to the large whiteboard with a marker to write it on the big board instead of each having their own. With the younger students, I've also had them dictate using manipulatives (read more about what I use for this and where I get them here). Mixing up the teams, adding another beat to each example, or changing how I present the examples (playing a rhythm on an instrument instead of clapping, etc) are all other easy ways to keep things interesting. The students love this game. It is just enough competition to get everyone excited and motivated but not too much pressure for the kids who get stressed by the feeling of losing. It's also an easy way to help students understand how to help each other without taking over- they have to help their teammates know what to write without actually writing it for them. What are your favorite ways to make music dictation more exciting for students? Share your ideas in the comments below! Want more? Subscribe to the Organized Chaos newsletter right here to get ideas and resources sent straight to your inbox!